Ask Away Blog: Share Your Hero + Enjoy Some Cookies! Is there such thing out there as someone that doesn't enjoy cookies? I absolutely love cookies, especially with milk! It's the perfect dessert, evening snack, or treat after a difficult day at work. Cookies just make me happy. Today's post is not just about cookies however. It's about an awesome opportunity to share YOUR hero with Mrs. Fields and get the chance to make an impact to a cause your hero cares about. I'm all about companies and products that do double duty and give back to the community and the world as a whole. And that's just what Mrs. Fields and the Share Your Hero campaign is doing. Before I explain any further let's clarify what a hero actually is. Some people think of heroes as those who wear capes and have special powers. Some consider their own friends and family heroes. And some have a special connection with someone who has either done a lot for them or maybe they've seen them do a lot for others and they feel compelled to celebrate it and let others know. Well, now's the perfect opportunity to let everyone know who your hero is! With the Mrs. Fields Share Your Hero campaign, all you have to do is share your hero's story and a donation of $5,000 could be contributed to a charity of their choosing! 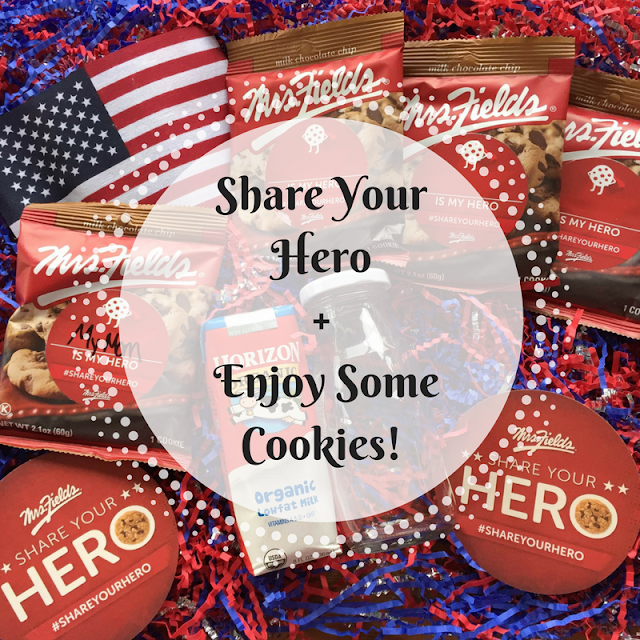 And everyone who shares their hero on this form will receive a coupon for $1 off a box of Mrs. Fields cookies! That sounds like a pretty sweet deal to me! Literally! Love cookies and love what this company is doing!